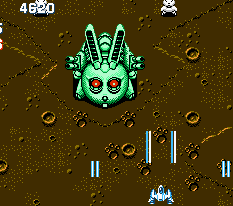 Gun-Nac was released in 1990, around the same time as MUSHA. 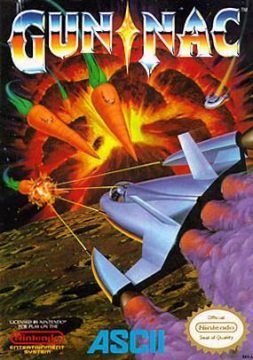 The title is a combination of “Zanac” and “Gunhed“. 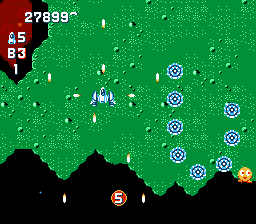 The game plays similarly to Zanac (minus the procedurally generated enemies), though it has a comical element that feels like TwinBee. 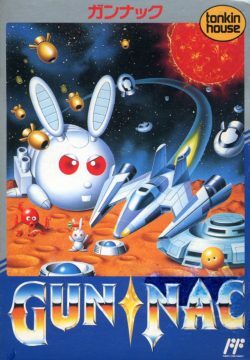 Animals, plants, and factory products have mysteriously gone crazy attacking the galaxy, and only a commander named Gun-Nac can save the day. 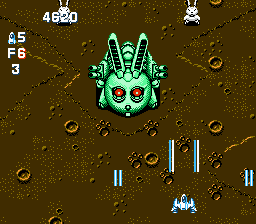 The first level is based on the Japanese folk tale of the moon rabbit, so you’re attacked by both carrots and mecha lagomorphs. 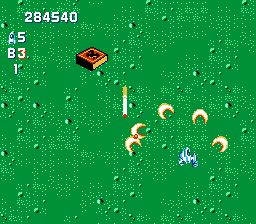 In the second stage, you dodge matches and cigarettes (only in the Japanese version, as these were changed to missiles and suitcases in the American release). 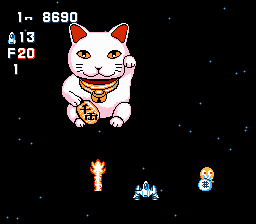 Others reference various bits of Japanese culture, like bosses based on the Maneki Neko “lucky cat” statue and haniwa figures. 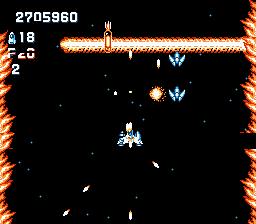 There are five weapons, along with an additional “Wing” attachment, which not only provides extra firepower but also absorbs a single hit. 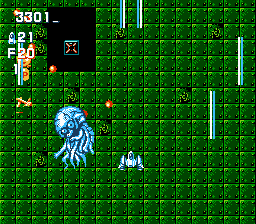 The best of these is a flamethrower, which has both strong power and decent range. 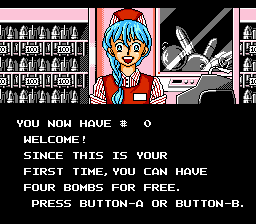 There is also not one but four different types of bombs. 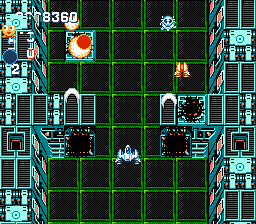 Like the weapons, their power can also be upgraded by picking up the same bomb icon several times. 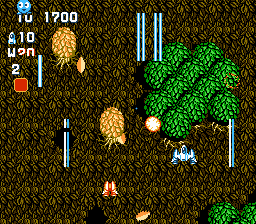 In addition to score, you can also shoot blue Randars to drop cash bags. 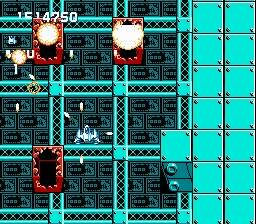 These are used at a shop between levels, which can be used to change or upgrade weapons, change your speed, or spawn more bomb pickups in certain levels. 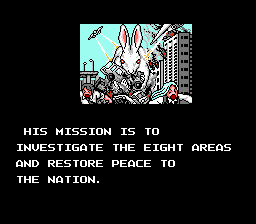 Cheekily, the option menu is named “CONFIG.SYS”, after the DOS bootup file, and includes options that let you prioritize sprite flickering or slowdown. 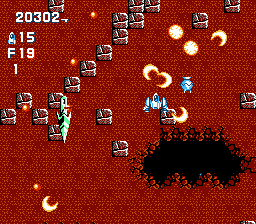 The bullet “ricochet” option will also enable enemies to fire suicide bullets. 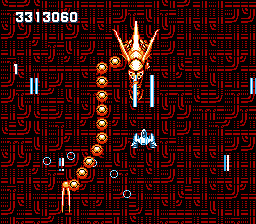 Four years had passed since the release of Zanac, and Gun-Nac is on a whole different planet, technologically. 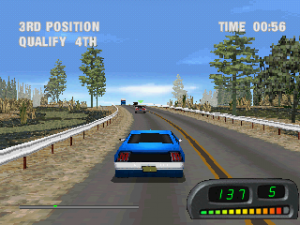 The graphics are much more attractive, the pacing is faster, and the sound quality is punchier. 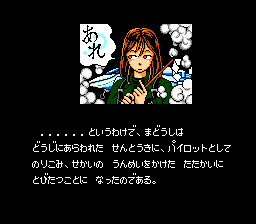 There are several difficulty levels (in the Japanese version, the easiest is “stress reliever”), which also affects the ending. 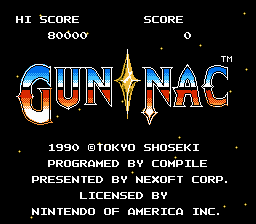 So even though Compile had moved onto 16-bit platforms by this point, Gun-Nac is still an impressive technical achievement surpassed only in speed by Naxat’s Recca, and it ranks as one of the best on the system. 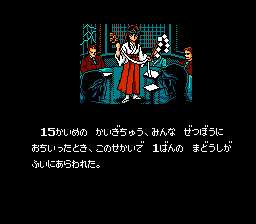 The American version cuts a few of the cinema scenes, like the intro which shows the pilot dressed as a miko and doing spiritual exorcism.